A Better Way to Screw. | A Continuous Lean. A Better Way to Screw. I came across an interesting article recently about the Phillips screw and its inventor Henry F. Phillips. It was surprising to learn that in a moment of innovation in the late 1930s, Cadillac was the first company to use the Phillips screw. As someone who has the collectively random interests of history, WWII and and U.S. manufacturing, this story is a gold mine. My friend Mark was telling me the other day that his four-year old son is at the stage in his development that he is constantly asking questions about everything. Apparently, the most common query is – why? In a way, I think I never really grew out of that phase (and I’m sure many of you are the same way). I look at an everyday object and wonder what the story is behind it. What went into it becoming what it is? Because everything has a story, even something as simple as a Phillips screwdriver. The screw was invented in the early 30’s by Henry F. Phillips, a Portland, Oregon businessman. He knew that car makers needed a screw that could be driven with more torque and that would hold tighter than slotted screws. Car makers also needed a screw that would center quickly and easily, and could be used efficiently on an assembly line. The Phillips screw was designed so that it could be driven by an automated screw driver with increasing force until the tip of the driver popped out without ruining the screw head. So what many consider a design flaw is actually a feature (at least if you’re a car manufacturer). The Phillips screw first gained acceptance with Cadillac in the late 30’s. Although there is a Phillips Screw Co. today, the company never actually made Phillips screws or drivers. They were produced under license by other companies. 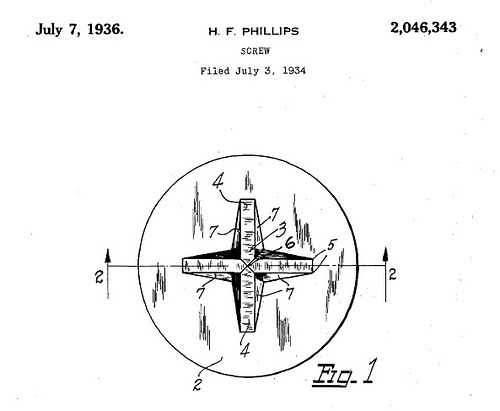 Unlicensed knockoffs proliferated, so that in 1949, Mr. Phillips was stripped of his patent. Use of the Phillips Screw spread through the automobile industry at a rapid rate. By 1939 it was used by all but two automobile manufacturers. By 1940 Phillips screws were used by the entire automotive industry. Although one major manufacturer still would not use them on its passenger cars. Gradually the Phillips screw and screwdriver worked their way into other industrial applications, then consumer products, and eventually showed up in hardware stores. American Screw Company spent approximately $500,000 in the 1930s to produce the Phillips screw, and obtained patents on the manufacturing methods. It was the sole licenser of the process. By 1940, 10 American and 10 foreign companies were licensed to manufacture the screw. The American Screw Company advertised that these fasteners could speed up auto assembly lines because they could be used safely with power drivers–tools that might slip and mar a car’s finish if used with conventional slotted screws. These screws could also be driven with more torque and would hold together tighter than slotted screws. Phillips screws also centered more quickly and easily. Mr. Phillips had come up with a recessed cross screw designed for efficient installation on an auto assembly line. The idea was that the screwdriver would turn file screw with increasing f1orce until the tip of the driver popped out–which brings us to the real reason behind the invention of this screw: It was designed to come out as if was driven in by screwdrivers so the screw head would not be ruined or broken off. When tightening a Phillips screw with a Phillips screw driver you will notice that when the torque gets to be too strong, the screw driver winds itself out of the screw–a feature built into the design of the system. A recent evolution of the Phillips design resulted in the patented ACR Phillips II(R)–a screwdriver that has ribs on both the driving and removal faces on the wings, making it ideal for assembly line and home use. 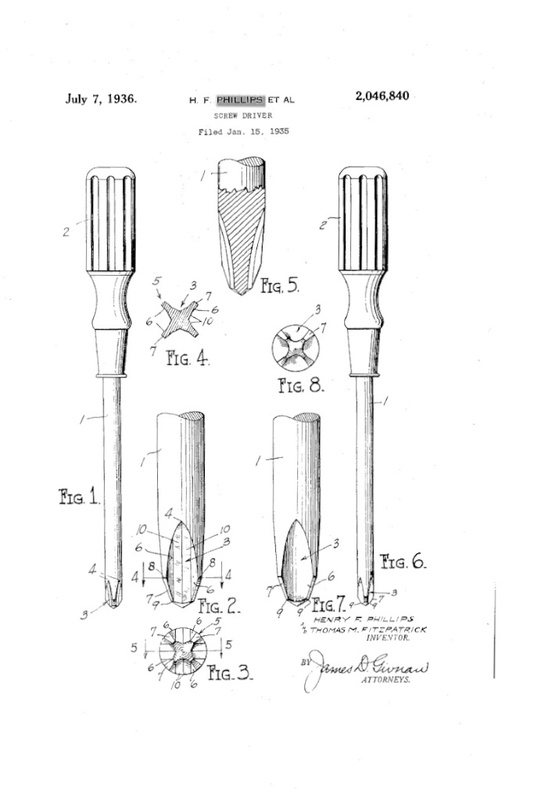 Fastener-Fan Alert: “One Good Turn…the Natural History of the Screwdriver and the Screw” by Witold Rybczynski, one of the best technology writers alive, and, yes, also a Canadian. Great article. You always have such a keen eye on smart observations. I wasn’t aware of the “slip-out” element of the design, nor the exacting efficiency element. Makes perfect design sense – so simple, yet so illusive. ( borrowed statement from Jonathan Ive). Why does the article refuse to say that it was FORD who would not use these screws? Probably because of a far reaching conspiracy between Henry Ford, Stanley Tool Manufacturers, Philips-Magnavox and the Tucker Car Corporation, Neville Chamberlain and Tojo. Glad to see some fans of the Robertson, Easily the best Screw out there, doesn’t strip, easy to use vertically. Great. I was born and raised in P.L. Roberson Hometown, Milton Ontario,and currently live about a block from his original home. Its a beauty of a home, for sure.